The versatile Brown was utilized primarily as a flanker in college and also as a runner from scrimmage and kick returner. He ended up as Notre Dame’s all-time pass receiving yardage leader (2493 on 137 catches), returned six kicks (three punts and three kickoffs) for touchdowns, and won the 1987 Heisman Trophy as well as receiving consensus All-American honors. 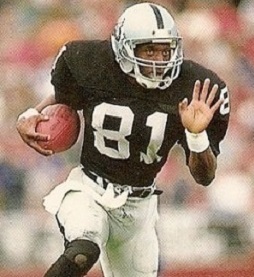 Brown was chosen by the Raiders in the first round of the 1988 NFL draft (sixth overall) and had an impact both as a pass receiver and kick returner. Raiders went 7-9 to finish third in the AFC West. Brown’s 1989 season ended with torn knee ligaments in the opening game and he was slow to come back, following up with a mediocre year in ’90. He began to return to form in 1991 and ’92, catching 36 and 49 passes, respectively, before breaking out with 80 receptions for 1180 yards and seven TDs in 1993. It was the first of seven straight seasons in which he had at least 80 catches and nine consecutive thousand-yard receiving totals, with highs of 104 receptions and 1408 yards in 1997. While lacking his former speed, Brown remained a dangerous runner after the catch. He stayed with the Raiders, who returned to Oakland in 1995, through the 2003 season, a total of 16 years, and caught 1070 passes for 14,734 yards and 99 touchdowns, all franchise records, as well as his 104 total TDs. He finished up with Tampa Bay in 2004, bringing his career totals to 1094 pass receptions, which ranked third in NFL history at the time, for a second-ranked 14,934 yards and 100 TDs. He added another 45 catches for 581 yards and three TDs in 12 postseason games. As a kick returner, he averaged 25.2 yards on 49 kickoff returns with one TD and 10.2 yards on 326 punt returns, scoring three touchdowns. In all, he compiled 19,682 all-purpose yards, the league’s fifth highest total at the time. Brown received consensus first-team All-NFL honors once, at least some first-team recognition after one other season, was first- or second-team All-AFC seven times, and was selected to nine Pro Bowls. He was inducted into the Pro Football Hall of Fame, Class of 2015.